Caravelle is no longer active on the iTunes AppStore. It was a financial disaster to keep the application on the store. I'm planning to make a non-AppStore version and probably make it open source. Sorry to disappoint, I'm also frustrated. I've put into it at least 3 years of hobbying. I stopped having time to support the tsunami of deprecations Apple is always imposing on Developpers. Caravelle is a File manager featured with a dual pane browser. This feature is particularly useful to manage transfer from one location to another, avoiding the use of the traditional Select and Drag&Drop. Its inspired on applications existing in the PC environment such as FAR, Total Commander and Free Commander, but unlike other similar applications, this one is completely written in Mac OSX native language and uses Cocoa foundation. If you are a multi-platform user and you miss the classic Windows and Linux key behavior, then, this application is for you. 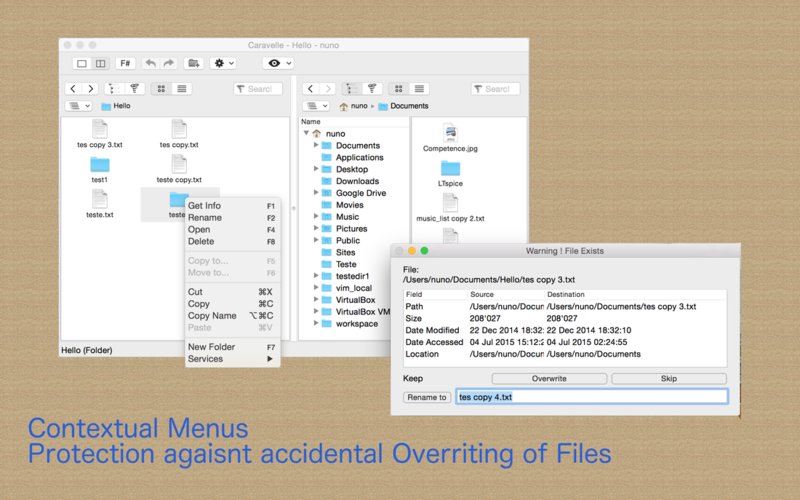 Cut, Copy and Paste which works for either copying files, file paths and file names. More information on the Caravelle roadmap and contact information can be found here. Writing a File Manager is a responsibility not taken lightly. This application was done using the best practices in software development to assure data integrity and security. It follows the iTunes AppStore rules in regards to User Data Protection. This means that the user has total control to what the application can "see". The Application will not collect information and nor will connect to the internet for data transfer. For data protection, the application will never delete a file from the disk. It will only just move it to the Recycle Bin for further deletion once the Bin is emptied. This version is provided free for your benefit. This offer is time limited so please don't delay giving it a try. Comments, suggestions, or problems found and improvement points are very welcomed.